For our household, sending our dog off to be trained was not an option. It was something I wanted to do myself but I had no idea where to begin. I cannot recommend enough checking out Rick and Ronnie Smith and the seminars and videos they have produced. They teach the Silent Command System developed by Rick's father, Delmar. Check them out at www.huntsmith.com and look for a seminar near you. I've had the pleasure of going to seminars conducted by both and you won't be dissapointed! You'll be amazed what you dog can accomplish with some structured instruction! Below is a picture of Rick Smith demonstrating with Rylee. 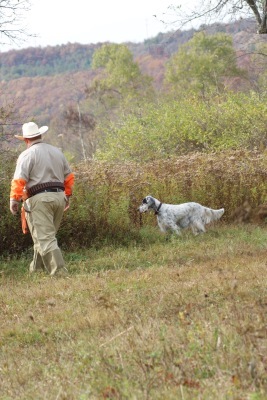 Often I get asked if our "pretty" dogs can hunt. I respond with "most definitely!" and I have to say it is probably our favorite activity! We started our search for the perfect pet looking for a breed that we could do anything with. We wanted a companion that was comfortable both in the house and out. I had dreams of having a sporting dog that I could hunt with but even at that I wasn't decided on what kind of hunting I wanted to do. 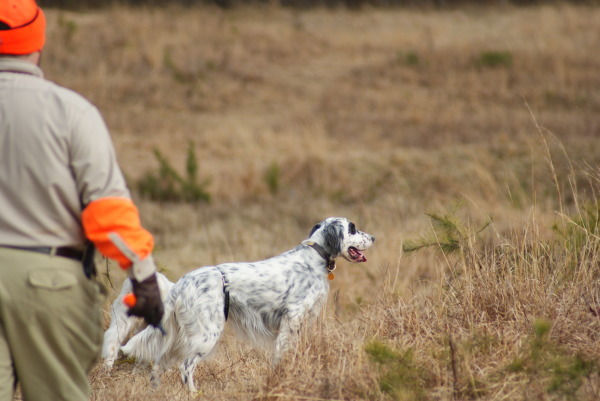 After months of research we came across the English Setter. More specifically we fell in love with the bench type or Llaverack setter. 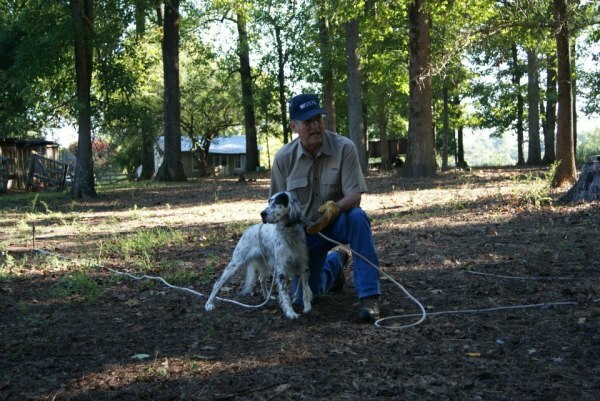 By now you can tell there are two types of setter in the states, the Llewelin or field setter, and the Llavarack or bench setter. While similar there are quite a few differences. Bench setters are generally larger than field and carry quite a bit more coat. Bench setters generally don't run as big as the field setters but for my purposes that is exactly what I was looking for. 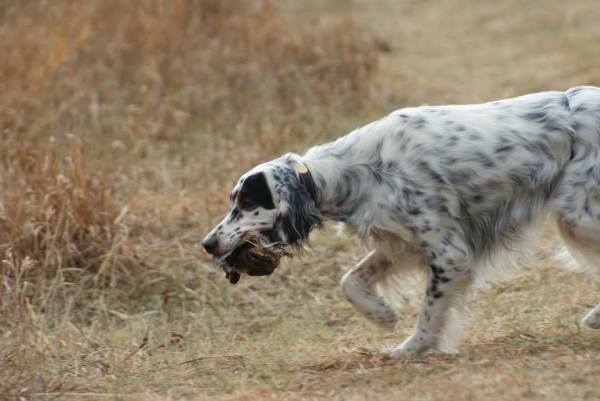 The setter is described as a "gentleman's dog" and they fit that description well. 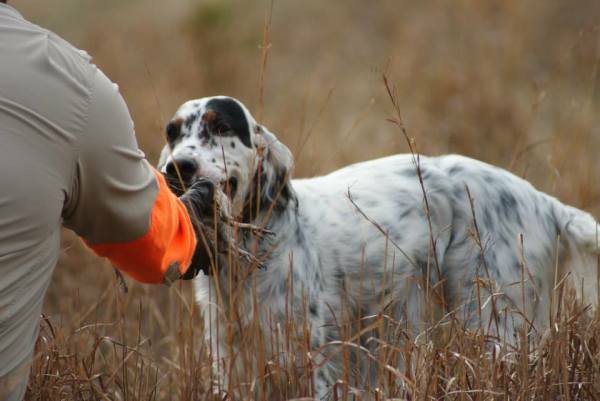 While upland hunting with them they are a very methodical working breed and tend to do an excellent job. We've had great fun competing in NSTRA field trials. They are a walking trial with a 30 minute brace. I encourage new and old hunters alike to check out the opportunities and the local chapter in your area.